Buy "s-172" £7 inc UK p&p. Over the past half century, opinion has been divided as to the role of Lee Harvey Oswald in the assassination of President John F Kennedy. The rumours that the accused assassin may have been working for or was manipulated by the United States Intelligence apparatus began to spread almost as soon as he was arrested. The evidence raised two as yet unanswered questions: how had a former US Marine been able to enter and exit the Soviet Union so easily? Was he a double agent or the fall guy for a wider plot? In the half century since, perhaps the most tantalising piece of evidence has been largely overlooked. Congressman (and future president) Gerald R Ford, who served as a Warren Commission member in 1964. revealed in his 1965 book ‘Oswald: Portrait of the Assassin’, that the FBI had an ‘undercover agent' in Dallas at the time of the assassination and that that agent (official code S-172) was none other than Lee Harvey Oswald. Fifty years on mystery still surrounds the events of the 22nd November 1963 and the confused aftermath. 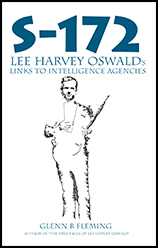 Here acclaimed author Glenn Fleming seeks to answer the two most asked questions in the whole JFK assassination: Who was Lee Harvey Oswald and what was his role on that fateful day?